Hope is a friendly, close-knit community of students, faculty and staff who share your Christian faith, your commitment to service and your desire for a well-rounded educational experience. Friendships you make while living on campus, attending classes, and participating in social service events will last a lifetime. University life is a blast, make the most of it! "This is the best community of people I've ever been a part of. Everyone is supportive and wants to see you succeed." When it comes to studying for tests, completing research papers or finding a quiet place to study, this is the perfect place to go. 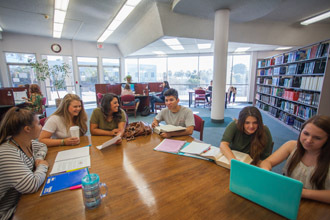 In addition to an exhaustive collection of Biblical commentaries and scholarly books, journals, and periodicals on every subject, the library also gives students access to online research databases. These offer students even more sources to use for their classes and are available 24/7. You will find the Del & Ann Harris Fitness Center on the first floor of the Lawson-Fulton Student Center. It is available to current students, staff, faculty and alumni. Athletic teams use the Center for conditioning and training as part of the university’s sports program. Generally, the Center is open the same hours as the Student Center. Proper identification is required to use the facility. With comfy couches, tables and chairs, a refrigerator and microwave, and wireless internet, this lounge is the ideal home away from home for our commuter students. HIU is committed to building a sense community around great food and fellowship in a comfortable and welcoming environment. We offer residents a variety of restaurant choices in two locations, and provide high quality cuisine that is both authentic and healthy. Our Dining Team is family-oriented and provides a friendly, interactive experience for our students and campus community. Provider Contract Food Service proudly manages Dining Services for HIU. Creating a secure campus environment is of prime importance to everyone at Hope. For this reason, we make the Hope International University Campus Safety Department accessible to answer calls 24 hours a day, seven days a week. Whether you are looking for textbooks, study tools, fiction novels or HIU gear, the online bookstore has it all. Find out exactly what books you need for each class and then choose between a print book, e-textbook or rental. The bookstore is also a one-stop shop for school supplies to you can make sure you have everything you need to tackle every course on your schedule.